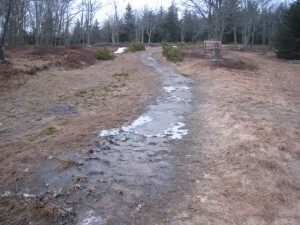 The high plateau known as Dolly Sods, in Appalachian country, is a good place to consider Dillard’s statement—especially in winter. My friend and I hiked the Sods on a recent January day. We had come to West Virginia to ski, but a few days’ rain had washed away the season’s accumulated snow, leaving only miserable little icy patches clinging to tree roots and shady hollows. So instead we walked through a sodden world of mosses, ferns, and bogs. Water flowed from time to time down the paths, forcing us to either hop from wet rock to wet rock, or skirt the muddy edge. On our first attempt at a trail, we came to a place where water apparently flowing from both directions made a wide, foam-flecked pool, blocking the way forward. We looked for a bypass, but the rhododendron on either side was too thick. So we retreated downhill and chose a different route, which set us toward a creek two and a half miles distant. Our new route took us through woods, across meadows, over streams, and around trees that had been knocked over like dominoes by Hurricane Sandy, blocking the path at intervals and forcing detours. The landscapes seemed scattered, random: here a grove of young beeches, there a pine plantation, a spruce forest, a blueberry meadow or a limestone outcrop. The brown leaves on the ground were frozen and matted, making a pretty papier mache earth. The ground itself was springy and crunchy, pleasant to walk on. At times we found ourselves stepping on pink and green mosses, soaked through like sponges. A low cold sky hung over us, grey as if reflecting the stones below. It was a world of water up in the Sods, soaking ground, moss, boots, socks, pant legs. Water flowed every which way, sometimes seemingly both ways at once, turning trails into rivulets, streams, and occasional ponds. It became hard to remember one waterlogged piece of trail from another, or whether the last stream we crossed flowed left to right or right to left. Finally we came to the Red Creek, running fast and brown with tannins. The water tumbled and roared mindlessly, endlessly down a steep gorge, always changing, always the same. We stood on the wet rock next to it, struck by the display of raw, pointless power. Then there was the ice: nature’s answer to the monotony of water. We walked over ice that had frozen on the ground in paper-thin sheets, sometimes forming concentric rings like topo lines on a map. We saw ice that seemed to grow vertically from the ground, like silver hairs fixed with gel. 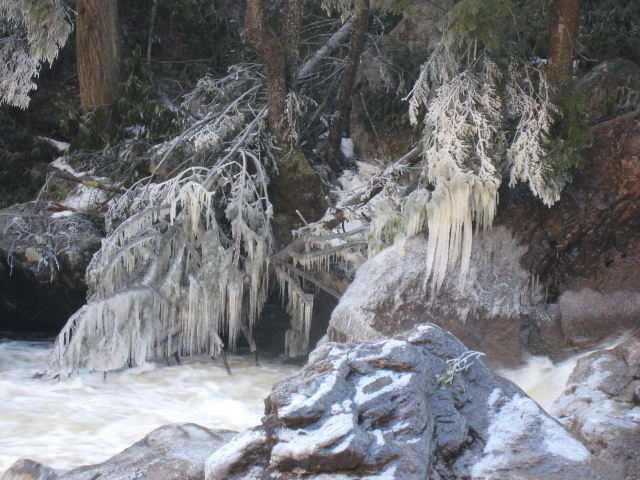 We marveled at combs of icicles formed by waterfall spray that then froze. We saw ice deposited on trees as supercooled water in an ice storm, smoothly sheathing branches. At one point we came across an inexplicable three-inch ice stalagmite. Later on our walk back we saw it again, comforting us that we were on the right path. That tiny unexpected sliver of ice was more distinct, and thus more memorable, than any of the much larger visual clues in our vast landscape. For me, ice in the temperate zone is precious and should be treated like fine glassware. But my friend enjoyed breaking the thin veneers of ice that formed over depressions in the trail, figuring, I suppose, that nature would do the same in a day or two. We shared the place with no one and no creature that I saw, save, briefly, one bird. Besides him (or her), we were the only audience in this cold theater. Others were living there; we could tell because we saw what they left behind on the trail. But they didn’t care to put in an appearance that day. Where were they—and what secret scenes were we not witnessing? And what were we doing there, anyway? Unlike the animals, we had no food to find there, no vital purpose driving us. Indeed, there was precious little up there we could have eaten: moss, maybe? Not much shelter either, nor creature comforts. We ate peanut butter-jelly sandwiches and trail mix on a cold rock and didn’t linger: only movement kept the blood flowing. Were we there to “keep an eye on things,” as Dillard suggests? Why not let the scene play to an empty house? The players don’t care—the beeches would have shivered; the spruces would have whispered; the water would have seeped, trickled, and spilled all the same without us. I admit I don’t have a better answer, beyond the meeting of eye and sky, ear and torrent, face and chilled air. In short, we went there for sensations and unexpected things. It’s awfully lonely, isn’t it, having only ourselves to talk to? The rest of nature seems to speak a language we’ve forgotten: one of scents, chemicals, magnetic cues, photoperiods, and subtle sounds beneath our threshold of hearing. We sense these things too, vestigially, but we’ve become so enthralled with our pretty speech, like babies practicing nonsense words, we practically refuse to listen to anything else. Nature has become a foreign country, we need to relearn the language. Sometimes I wonder about our frantic activity on this planet. Is it just a palliative for some deeper loneliness, a loneliness we brought upon ourselves by deciding to speak only to each other? Otherwise why do we expend so much effort to constantly gather together, when it rarely brings us food, shelter, or any of the other necessities of life? And why do the world’s religions seem to agree on at least one thing: humans should couple and create more of themselves? As we’ve ballooned to seven billion and beyond, we’ve had a collective impact on this planet at once superficial and profound. We’ve rearranged most of the land surface, except for those places that are truly inhospitable. We appropriate nearly half the planet’s biological productivity—we, who are only one species out of 10 million or more! And we have taken it upon ourselves to liberate from the ground, in a couple of centuries, quantities of carbon the earth has been storing for millions of years. We may dominate earth’s ecosystems, as a group of prominent ecologists has suggested, and yet, I can imagine the other members of those ecosystems laughing ruefully at our absorbed self-importance. All of humanity has become like that annoying American abroad who can’t understand why the people around him don’t understand English, and thinks maybe if he just talks louder… Meanwhile, our atmospheric carbon blanket thickens, the extinctions pile up, and we careen ever faster toward our strange and unknowable future. Once I realized we wouldn’t be skiing, I wanted to write another piece about the death of winter. But Chip Chase, the owner of the Whitegrass cross-country ski “resort,” complicated things for me. He told me that bare ground in winter is not unusual for him—in West Virginia you’re always on the edge of good snow, and even in January you’re prone to warm spells. In fact, Chip said some of the past few years—which have been some of the warmest on record globally—have also been some of his best. This season, for example, Sandy dumped two feet of snow in late October, and the season was off and running. So much for easy narratives. Dillard, A. “Teaching a Stone to Talk.” Harper & Row, 1982. If you’re a writer looking for a good symbol, consider the tree. The author of Genesis did, twice: he placed the tree of life and the tree of knowledge front and center in the Garden of Eden. Homer did, too: When his hero Odysseus returned home after twenty years of war and travel, needing to prove his identity to his skeptical wife, Penelope, he used a tree. “Move our bed into the hallway,” Penelope told her servant, laying a trap. (I’m paraphrasing here.) “It can’t be done,” Odysseus protested. “I carved a post of that bed from a living olive tree.” Only then did Penelope believe the strange man was really her husband, as steady as that post. Trees have long impressed us with their steadfastness; in fact, some trees from Biblical times are still with us today. But a new story I read recently casts trees in a different role. I first came across a version of this story in a paper published in the journal BioScience in 2007. The authors looked at where trees live using what a tool known as a “climate envelope,” which is a line drawn on a map around the entire range where a given species is able to survive. The scientists compared climate envelopes for 130 trees under 2007 conditions to those predicted for the end of the century, using the same computer models that the UN’s Intergovernmental Panel on Climate Change bases its forecasts on. On average, they found that trees’ envelopes moved 700 kilometers north, nearly the distance from Memphis to Chicago. So does that mean our trees will be moving north as things get warmer? Traveling trees can make great stories: Shakespeare’s Macbeth was vanquished when Birnam Wood moved a few miles to his fortress at Dunsinane Hill. And it would be dramatic indeed if future northern woodsmen and women hunt deer among sprawling live oaks and big-leaf magnolias instead of spruce and pine trees. But the scientists who wrote the BioScience paper noted that actual trees are unlikely to track their climate envelopes’ northward migration in the coming years, at least if unassisted by humans. Trees can “move” up to a few miles in a generation, by setting their seeds aloft in the wind or encasing them in a shell so they can survive a trip in the gut of an animal. But tree generations are long, and most seeds land close to home. Sugar maples, for example, lead a chaste adolescence, and don’t start making seeds until the age of 22 or so. They then send out seeds attached to little helicopters, which spin and float at most the length of a football field before touching down. Scientists estimate trees’ maximum migration rate to be around 50 kilometers per century, with many traveling far slower—a tortoise’s pace in this race.